The Ministry for Primary Industries (MPI) is seeking public feedback on management settings for the squid fishery around the Auckland Islands to manage interactions with New Zealand sea lions. The islands, lying almost 500km south of the South Island, are home to the largest breeding colony of New Zealand sea lions, which are classified as nationally critical, says MPI’s director fisheries management Dave Turner. The commercial southern squid trawl fishery (SQU6T) overlaps with the foraging range of sea lions that breed at the Auckland Islands, which can lead to the accidental capture of sea lions in fishing gear. “We need to balance the importance of the squid fishery – which employs hundreds of New Zealanders and brought in $68 million in export earnings last year – with the need to conserve these important New Zealand mammals,” said Mr Turner. MPI closely monitors the fishery with more than 80% of vessels operating there carrying government observers in the past 3 years. This helps ensure we get good information about how the fishery is operating. 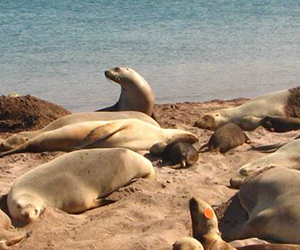 “It’s important to note that fishing is just one of a number of threats sea lions are facing. The biggest threat is disease. We need to look at all the threats and do what is right for the sea lions. That’s why MPI and DOC [Department of Conservation] are implementing the New Zealand Sea lion/rāpoka threat management plan”, he said. Submissions on the proposed changes close at 5pm on 7 September 2017. To read the consultation document click here. Email your feedback before 5pm on 7 September 2017 to FMSubmission@mpi.govt.nz.